The debut album by Cairo’s Nadah El Shazly is a uniquely eccentric LP; I’ve heard a lot of new music in 2017 but nothing quite like Ahwar. It may prove to be something of a discombobulating listen at first yet return trips reveal a genuinely adventurous and musically rich record. Debut albums always seem to appear out of nowhere yet the album actually took two years to complete. Moving between Egypt and Canada in her quest for inspiration, Shazly enlisted the talents of a number of likeminded musicians. The presence of Maurice Louca and Sam Shalabi from The Dwarfs of East Agouza seems apt. 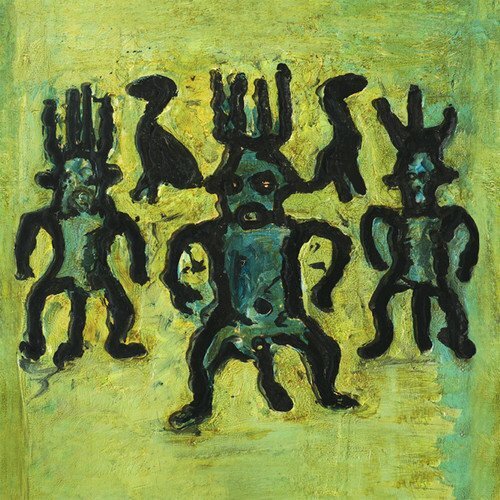 The Dwarfs are one of Alan Bishop’s projects and the experimental spirit of the legendary Sun City Girls can certainly be felt in the albums opening track, ‘Afqid Adh-Dhakira (I Lose Memory)’. Processed and manipulated vocal chants lead into shuffling drums and an incredibly loose, dreamlike structure. Shazly’s seductive vocals, sung in Arabic, leading us through these strange and wonderful soundscapes. We’re already deep into the marshlands signposted by the album’s title (Ahwar meaning marshlands in Arabic). Ahwar melds traditional sounding, Egyptian instrumentation with bold sonic explorations into the unknown. Many are given the label but Shazly really is an innovator. While never sounding directly like either I can hear the spirit of experimental heavyweights Moondog and Alice Coltrane alongside the very clear Egyptian influences. Ultimately, those are just my reference points. It’s difficult as Ahwar really does feel like a unique piece of work. ‘Barzakh (Limen)’ is a slow, meditative procession of Eastern scales led by violin and guitar with Shazly’s angelic tones floating over the top. The 8 minute track finds the more organic instrumentation mixing seamlessly with shuffling electronic beats. The droning, wordless chants put me firmly into a trance-like state. Purposefully repetitive yet awash with sounds and texture; ‘Palmyra’ is propelled by a hypnotic organ motif and some equally spellbinding, vaguely funky percussion. The next song drops us completely off the precipice; ‘Ana Ishiqt (I Once Loved)’ is a woozy mix of celestial harps, rumbling strings and seasick jazz-horns. Perhaps the most flagrantly avant-garde piece on the album, the track is actually a cover version of sorts; the original composition stemming from the father of Egyptian popular music, Sayed Darwish. ‘Koala’ picks up the pace with a more upbeat, yet no less challenging, jazz groove. Jazz is certainly a large factor throughout the LP; the improvisational feel and loose, flowing structures recalling the genres inherently experimental urges. ‘Koala’ is the most overtly jazz track here, a wall of discordant and untethered horns creating a brain-scrambling wall-of-sound. It’s certainly ‘not for everyone’ but those that appreciate music on the outer edges will find plenty to get stuck into. ‘Mahmiya (Protectorate)’ finally lets the fever subside with a slow, unquestionably beautiful piece. It’s a more open, sparse atmosphere that allows Shazly’s voice to float effortlessly over marimba and dusty slide guitar. Ending the album on a gentle and meditative tone, it also feels like a moment to catch your breath. It might be somewhat cliché to say so but it’s been quite a journey. Ahwar is an album of pure, unfiltered artistic expression; unrestricted and free of barriers. For that alone it’s more than worthy of your time. It’s also the most intriguing and genuinely interesting record I’ve heard this year.